Spread over two levels this New York style "Franklin Lofts" apartment features a large north-west private terrace and a car parking space on title. The location is fantastic close to Melbourne University, RMIT, QV Market, restaurants, multiple transport options, State Library of Victoria and an Aldi supermarket just across the road. Ideal to move in and enjoy yourself or a prime investment opportunity in this high demand building. The accommodation includes a spacious open plan living - dining area with polished timber floors and glass sliding doors to a large terrace ideal for extended relaxed entertaining and barbecues. The kitchen includes stainless steel appliances, gas cooking, dishwasher, rangehood and ample cupboard - bench space. There is also under the stairs storage and split system heating and cooling. 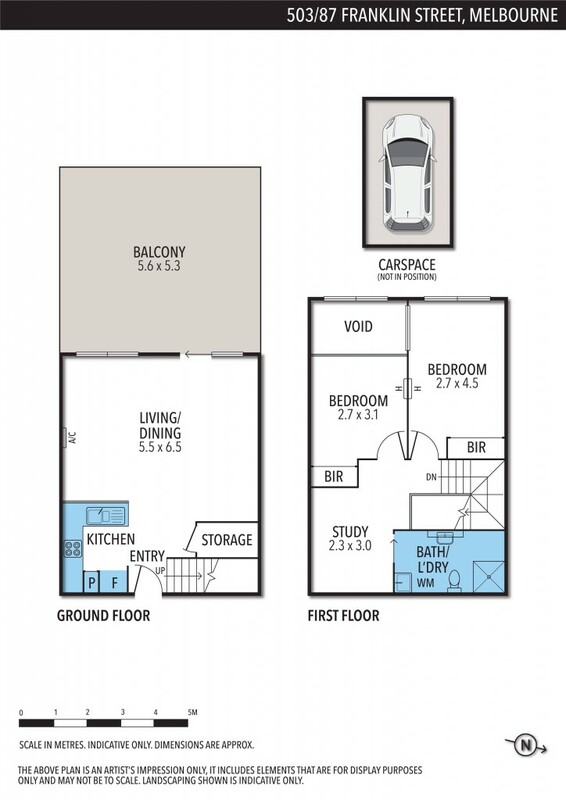 The upper level includes two bedrooms both with built in robes, a separate study area, split system heating and cooling plus central bathroom that includes laundry facilities. Additional features a car parking space, security intercom entry, an impressive building foyer, lift access and resident facilities including swimming pool, gym and sauna.